The Slayton Farms--Round Barn is a good surviving example of a type of round barn construction mainly found in Iowa--a round barn built of hollow clay tiles. It is one of 16 such barns believed to have been built by the Johnston Brothers Clay Works, a Fort Dodge firm whose model design used two sizes of tile--a smaller tile in the lower story and a larger tile above. The barn was built in 1915 for Frank Slayton, a member of an influential family in Hardin County. Hollow clay tile round barns have become a distinctive trait of Iowa's round barns compared to those found elsewhere. The era of agricultural prosperity during which these barns were built coincided with the state's leadership in clay tile production, when massive efforts were underway to drain her many wetlands in order to expand cultivation in the area's rich soils. The hollow clay tile silo was developed by clay tile manufacturers in cooperation with farm building specialists at Iowa State University and it gained immense popularity. 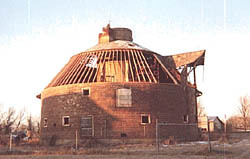 In similar fashion, the idea for constructing round hollow tile "silo" barns took hold and encouraged providers to market tile for building construction as well. The Slayton Farms--Round Barn exemplifies this type of tile construction. The barn has a gambrel roof with two differing pitches, and an attractive hay dormer. Two metal roof aerators are located on either side of a central silo. 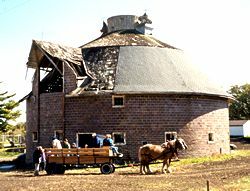 Within the barn, the lower level is arranged in circular fashion around the silo, from which silage was shoveled for feeding the cattle. An overhead track system and bucket for hauling materials is virtually intact. Above, loft floor joists radiate outward from the silo, first to a curved laminated beam at the interior's center where the stanchions are situated, and from there extend to the outer hollow clay tile exterior walls. An interior ventilation system for the cattle in the lower level carries fresh air from openings up through ventilator pipes running from the loft floor along side the silo wall up to the metal roof ventilators. The barn is located near the southwest edge of Iowa Falls. The roof is seriously deteriorated and interior damage has occurred because of exposure to the elements. Local fundraising for restoration is underway, with the hope of saving this building. The Slayton Farms--Round Barn is located at 20478 135th St., Iowa Falls, south of the Chicago and North Western railroad tracks. It currently is not open to the public, however, a tour can be arranged by calling 641-648-4570. More information and photograph can be found at the Slayton Farms Round Barn website.